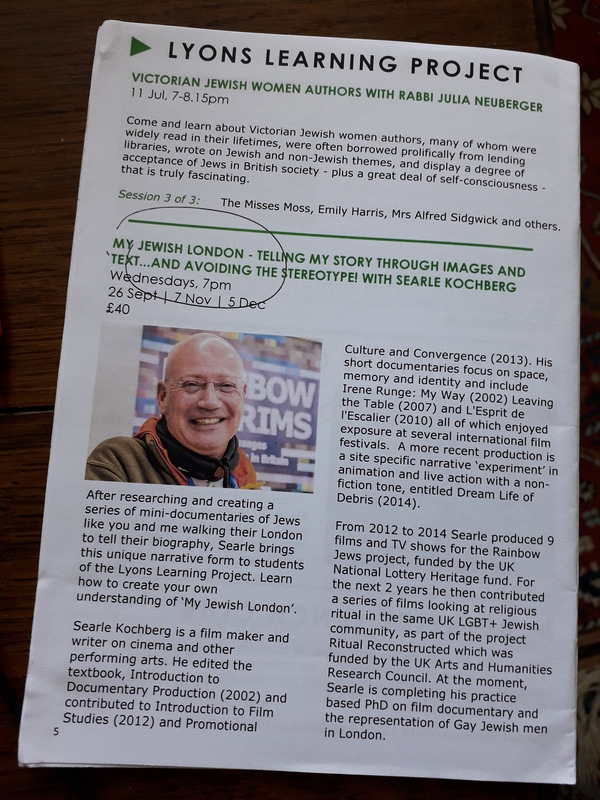 Ethnographic feedback - I will be hosting a 3 month dialogue and workshop at the West London Synagogue Sept thru Dec 2018, funded by the Lyons Learning Project foundation, exploring with Jewish community members the efficacy of lens media working methods in participatory video, based on my PhD working methods. This is at the invitation of the Foundation and Community, based on what they ee as the value of my work to date. Jewish Community members of the West London Synagogue. In my practical PhD I explore the performative utility of the recorded film event, the contemplative walk as a 'moment' of performance for maker and on screen co-creator, to decentre, challenge and upstage the dominant representation of Jewish London in mainstream documentary. I have taken as my fieldwork study the Liberal/Reform Jewish London Community – in particular the communities self defined as LGBT+ – Rainbow Jews. This work builds on previous research projects, Rainbow Jews (2012-14, funded by National Lottery Heritage Fund) and Ritual Reconstructed (2014-16, funded by AHRC, as part of the Connected Communities strand). Support from the Lyons Learning Project (funded by a donation from the Lyons Foundation, 2018) - has led to an opportunity to explore the impact of the research as part of a West London Synagogue Community education project looking at Jewish cross platform storytelling.